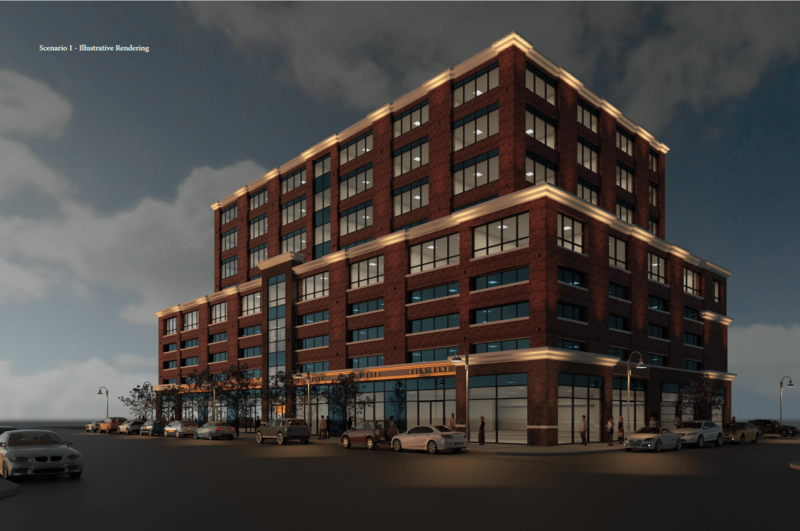 The City Planning Commission approved the construction of an eight-story mixed-use retail, community facility and office development in Jackson Heights. On May 24, 2017, the City Planning Commission issued a favorable report on an application from H & M LLC to facilitate the construction of a new mixed-use building with 219 accessory parking spaces at 74-04 Northern Boulevard in Queens’ Jackson Heights neighborhood. The application requested a zoning map amendment to change the project area from a C8-1 zoning district to a C4-3 zoning district, and a zoning text amendment to designate the project as a Mandatory Inclusionary Housing area. The applicant proposed the construction of an eight-story mixed-use building with 122,880 square-feet of floor area. The building would contain ground floor retail. The second and third floor would contain 219 parking spaces, some with double-stackers. The fourth floor would have 18,400 square feet of community space. Floors five through eight would be for commercial office space. Construction is estimated to take twelve months from final approval. The development site is a 20,000-square-foot lot that cover the full blockfront on the south side of Northern Boulevard between 74th Street and 75th Street. The site is currently occupied by a 10,066-square-foot car wash and an open parking area. The current zoning, C8-1, allows community facility, transient hotel, commercial, recreational and general service uses. A maximum floor area ratio of 2.40 is permitted for community facilities and 1.0 for commercial uses. The requested rezoning, C4-3, is the equivalent of an R6 zoning district allowing for a maximum floor area ratio of 3.6 for residential uses. The change would also permit community facility, local retail, service establishments, home maintenance or repair service, amusement, and large entertainment uses. Although residential uses are not proposed, the applicant requested the site be designated a Mandatory Inclusionary Housing area should the residences be developed later. On March 9, 2017, Queens Community Board 3 voted 17-8, with five abstentions, to approve the application with conditions. The Community Board requested that the applicant provide an attendant to oversee and direct loading dock activities at the proposed building’s freight entrance. The Board wanted the project to include a freight loading area entry and exit in a semi-circled pattern to avoid backing in or out trucks on 74th Street and that delivery times be restricted to between 10:00 AM and 2:00 PM, and They also requested that a meeting room be made available for community-related activities. At the Borough President’s hearing on the application, the applicant stated that the requested semi-circle loading design was not practical for the lot size. The applicant did note that the projected retail uses would not require large trucks for deliveries. They also agreed to limit delivery times to the suggested 10:00 AM to 2:00 PM. On April 21, 2017, Queens Borough President Melinda Katz issued a recommendation to approve the application. CPC: 74-04 Northern Boulevard Rezoning, Queens (C170162ZMQ; C170163ZRQ) (May 24, 2017). By: Jonathon Sizemore (Jonathon is a CityLaw Fellow and a New York Law School Graduate, Class of 2016).